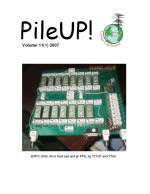 PileUP! on CCF ry:n lehti, jonka perusti Harri, OH6YF (Silent Key) v. 1997. Tein lehteä 20 numeroa vuosina 2006-2011. Apunani oli moni, erityisesti Esa OH7WV ja Kim OH6KZP.Avustajat on lueteltu numerossa 5/2011. PileUP! newsletter by Contest Club Finland was in my hands 2006-2011, and in collaboration with many, we made 20 issues. The 20 issues in PDF can be accessed by clicking the front cover thumbnail images. Have fun!. 2/06 SAC theme issue, 12 p, PDF released and mailing 6.9.2006 to foreign stations, prints 270, 4 to OH-members. 3/06 SAC aftermath, 36 p, only PDF released 12.11.06. 4/06 CCF-OHDXF Cruise, 24 p. PDF released 15.01.07. 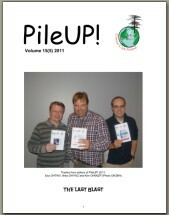 1/07 PDF released 28.3.2007. 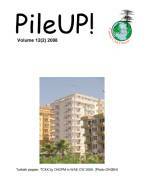 28 p.
2/07 PDF released 6.9.2007. 24 p.
3/07 PDF released 19.11.2007 28 p.
4/07 PDF released 7.1.2007 44 p.
1/08 PDF released 12.3.2008. 36 p. Google analytics downloads 12/1. 1/12, OH1NOA, OH1VR et al.